We are a bit out of practice when it comes to summer cookouts. Making it as easy as possible will minimize your stress, and your guests will still think you have created an indulgent spread. 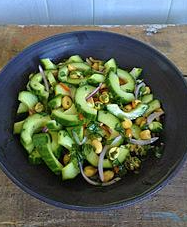 Try this quick, delicious and super flavorful salad from Food & Wine Magazine.